For your stay in Dinard, choose our hotel and its comfortable rooms. We welcome you in one of our 19 rooms for holidays with family or friends. Come and enjoy the neat and warm decoration of our rooms single, twin, comfort, triple or quadruple . 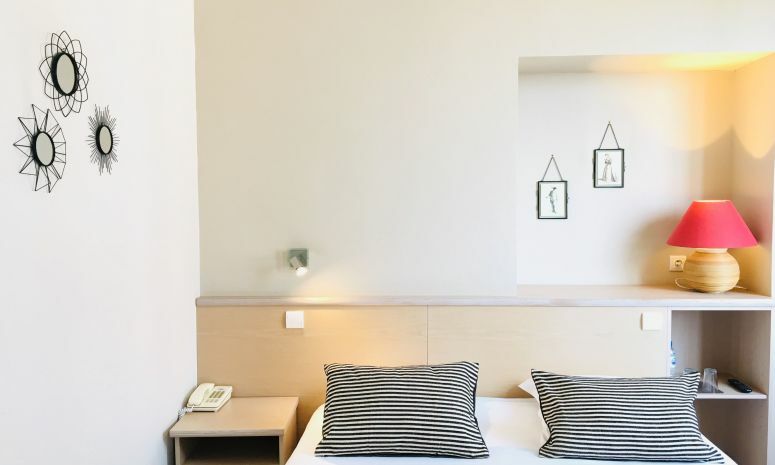 To guarantee a successful stay in Dinard, we offer various facilities available in the room: bathroom , telephone , flat screen TV and a wireless Internet connection . If cancelled up to 2 days before date of arrival, no fee will be charged or your deposit will be refund. If cancelled later, no-show or early departure, the total price of the reservation will be charged or your deposit will be kept. To guarantee your reservation, we require a credit card number and the expiration date. No amount will be taken by Brit-Hotel. The payment is directly made with the hotel after your stay. Please call the place if you are not expected to arrive by 9:00 PM.
. Promenade "Clair de Lune"
Friendly, efficient, will visit again. Perfectly happy, no need for improvement. Very comfortable bed and room . Great location and very welcoming and helpful staff. Had a wonderful stay .